I’m not sure exactly when I added this to my wishlist, likely in either June or July when I realized I couldn’t run daily due to hip/foot. It came off the library waiting list yesterday and I quickly posted about it to a runners’ reading group that I have come to love. Between people’s comments and someone else reading it simultaneously I decided to move it to the top of Mt. TBR despite my having library books expiring sooner. I was hoping to finish it over this weekend due to size (aka it didn’t fit well in my purse) and took it with me today due to some extended commute time, but I didn’t expect to finish it in one day. Part of the quick read is that a significant number of the book’s ~300 pages are dedicated to charts and diagrams and for that reason I was very glad to be reading this in print v. on my Kindle. Thoughts? This book is simultaneously an amazing reference/training tool and probably not the right book for me right now where I am in my running. The authors focus a lot on optimizing performance and that’s not for me right now. I want to improve, of course, and am slightly obsessed with my 5K PRs but I’m not yet to the point where I think I want to use the extensive data here in my training. Unlike in the past, I’m pretty sure I truly mean it. I want to enjoy my runs, I don’t want to obsess over pace and time. As they said in the book, running with your wrist in front of your face isn’t good for form. I also think their novice plan is at a higher level of novice than I am. Their week one long run is probably doable, but seems awful high compared to other plans I’ve been reading up on. I might give it a go tomorrow though as it’s not far off my prior longest run. What I really loved about this book? the pace tables. I find it very hard to know what my pace can/should be at a new to me distance/course. I still feel like I’m running blind so have definitely saved these charts. the precise workouts-what you should do and for how long. I’m definitely guilty of unfocused runs, and trying to change that. Their cross training workouts. Since I found that both of my Blink locations have rowing machines I’ve been doing that and I think the time/pace guidelines there are helpful. The explanations that running less isn’t working out less and how to use cross training to reduce injury risk and balance muscles worked. It’s not too science heavy. There’s a ton of useful data and explanations but they don’t overburden the reader with details on lactate threshold. This is a layrunner’s guide. I didn’t really care for their argument that “If you’re more than 30 pounds overweight, walking rather than running is advisable until you have reduced your excess weight.” What does that even mean? Reduced it to normal? Reduced it to 29 lbs over? It’s not particularly helpful guidance, nor do I think your success in running is predicated on the scale. But they’re health educators so I see where they’re coming from. I think this book is a great tool for someone who has run a half/full and wants to improve on that. It’s also amazing if you want a hands on, how to for Boston including a physical assessment test to see if a BQ is possible. I don’t think it’s for the novice runner trying those distances for the first time without a stronger base than is typical for beginning a plan for those distances. I look forward to revisiting this book in a year or so when I’m more experienced to see if the workouts work for me then. Speed wise for me, for now I may go back to the ASICS Pace Academy, or I may do the intervals like I did earlier this week. (Actually, I look back and realized I’ve been doing a version of those all along. Weird! I’ve also more or less tossed the junk miles when I threw out the 30m goal) I am going to use their 3plus2 model in my training because I think that will be the best for me in keeping foot/hip/knee happy. It won’t work exactly as they’ve designed, but I think it may well work perfectly for me. It also looks like it will work with some of the training plans I am leaning toward. Sounds like a sensible plan and a book which will be good for some but not for others. I enjoy stories about running far more than how-to books, but I should really take some on, I’m sure! The ones that come out under the Runner’s World brand are a mixed bag. They’re not updated enough and a lot of the info is available on their site as a subscriber. I enjoyed Hal Higdon’s how-tos and would recommend him if you decide you want to give that kind a go. He’s a good story teller and breaks up the how to with anecdotes. 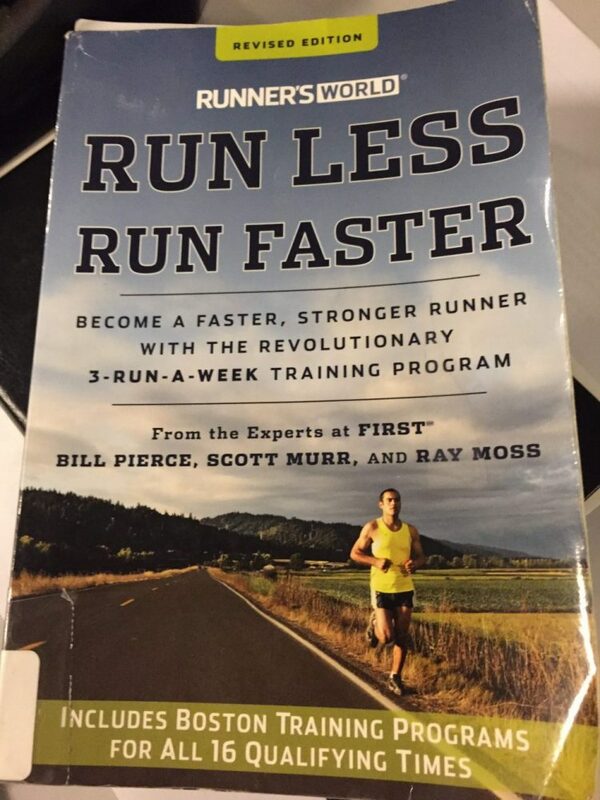 I think I still have a copy of his Run Faster… if you want it. (AKA I haven’t mailed the Iceland/Dean K ones yet). I definitely recommend the Becky Wade one I posted to the group about. It’s a mix of her memories as a college runner and studying international runners. Both techniques and trying their diets to see how that shapes their running. It’s a light read. Alas it’s library/Kindle so can’t send it your way. Yes, and the problem with the RW forums is people foaming at the gills to tell you their way is the right way, and opposite to what the other person said, etc. Argh! I would love the Run Faster if you have room in the parcel, thank you (what can I send you back???) and I have put the Wade on my wishlist.